its neo-gothic choir overhanging the village. 10/12/12 - Heritage - Geste, church - Thanks to a decree issued on 5 December 2012, the Conseil d’Etat formally rejected the appeal filed by City Hall in Geste requesting that the Nantes administrative court’s decision forbidding the demolition of the church be annulled  (see here and here). City Hall has thus exhausted its legal recourses and this decision should therefore become jurisprudence. Readers might remember that the demolition permit had been cancelled by the administrative court as it considered that the church presented an architectural importance although it was neither listed nor classified. The court had also contested City Hall’s assertion that the building was about to collapse, a false statement as we had seen ourselves when we visited the site. The absence of protection is no longer sufficient reason to demolish a monument. 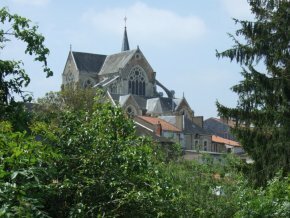 In fact, it does not seem normal that the DRAC had not protected this church whose quality is clearly obvious, and even more so by the way it inserts itself harmoniously into the surrounding village. We attempted to ask the mayor for his reaction but he responded by saying that for the moment he did not wish to comment, that he had to meet with his deputies at City Hall and would communicate directly with the residents. In any case, he will now have to restore the church, no doubt a less expensive operation, despite his earlier claims, than that of a demolition-reconstruction. If we were to be really cruel, we would refer our readers to the Geste website page where there is a very learned explanation stating that the building is "in no way a historical monument", that it is falling into ruin and that its restoration would be too expensive, an argument which the Conseil d’Etat has now swept off the table. An appeal to a higher court cannot be accepted "if the appeal is unreceivable or not based on any serious means." We learned the news through a tweet sent by Benoît de Sagazan who published the information on Patrimoine en blog.